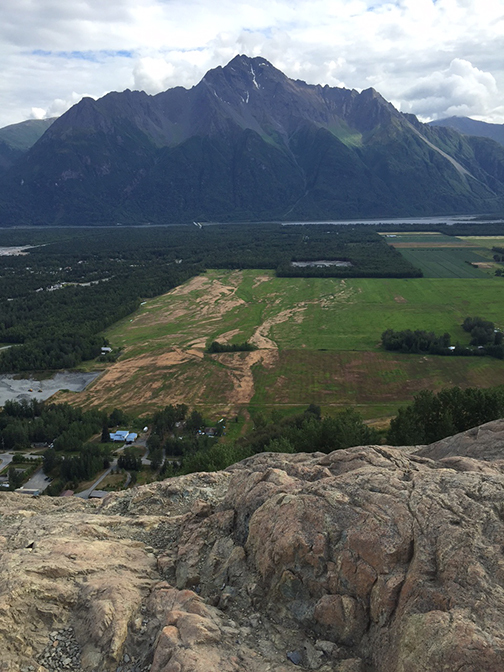 One of the best day trips around is right in the Mat-Su Valley&apos;s back yard, as the Butte offers stunning views of the Valley, a chance to get some exercise and best of all, it&apos;s free and very family friendly. The Butte is located just off Bodenburg Butte Road, off the Old Glenn Highway. The most popular route up the Butte is accessed by a Mat-Su Borough parking lot off Mothershead Road. For $5 a car, your entire family can set out for an afternoon of fun. For a map and a ton of information about the hike itself, click here. The Butte can be challenging for those who haven&apos;t hiked or aren&apos;t in great shape, but it&apos;s definitely doable for everyone, regardless of skill and stamina. The gentle hike to the base turns into a series of staircases, which make the hike up much easier than it has been in the past. Just as the stairs seems to be burning your thighs and calves, you&apos;ll find convenient rest areas with park benches overlooking the fields of the Matanuska Valley below. Make sure you&apos;ve brought your camera along, because once you reach the top (it doesn&apos;t take very long - 20-30 minutes depending on your pace), you&apos;ll be treated to panoramic views of the Chugach Mountains, Pioneer Peak, the Knik River Valley including the glacier, and much more. Make it an afternoon by packing a lunch and some snacks for the kids. Be prepared though, as it can often be windy at the top, and there is a lot of dust on the way up. You&apos;ll want to bring a water bottle or two, and don&apos;t forget sunscreen. On a sunny day, nothing beats the trip up and back. One thing to consider is to be respectful of the adjacent private property. Make your plans to take advantage of sunny summer weekends by planning a hike up the Butte!